For my interfaces I use mostly spatial sound. There no big deal about spatial sound as in real life it is always spatial. Which means you can tell, just by listening to the sound, where it is coming from. How does your brain do it? It relies mostly on two cues (out of 7). 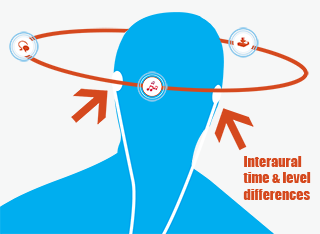 These two are the Interaural Time Difference (ITD) and Interaural Level Difference (ILD) (the other five are: Reflections from the pinnae and the shoulders, head motion, early echo response/reverberation, vision). ITD simply means that the sound waves arrive at one of the ears earlier than at the other, hence there is a time difference (unless the source is at 0/180 degree azimuth). The brain can compute the direction of the source from this. The ILD is similar: as sound waves are pressure differences in air the head blocks some of them. Let's say the sound source is on your right side - now your head will shield your left ear. This is again detectable by the brain (unless the source is at 0/180 degree azimuth) and helps calculating where the sound source is located. Touch screens are widely used, in mobile phones, laptops, on information displays of all kinds ... and they will come to elevators, too. Houses are getting higher and higher and "button space" is limited. And of course you can place nice adds on the screens while you transport people. I've looked at how such an interface could look like. Below you can see two prototypes I've made to run a small study on. They were displayed on a huge touch screen in an elevator simulator. But I've shrunk them for you. Click "read more" to see demos. Last year I attended the IPCity Summer School in Vienna. We've had three days to develop an Edutainment application based on the TimeWarp project developed by Fraunhofer FIT. This is a quick hack for an augmented reality guide. The idea was to create an immersive experience based on the story of Sisi (or rather her ghost). The user becomes a ghostbuster and has to collect items for Sisi's gost. The items are scattered all over Vienna and can be detected with a special (gadget) device (like all serious ghostbusters own). When the user enters the "hot zone" and comes close to one of the items, the local audio theme starts playing. Sound themes are atmospheric and set the mood for the next encounter with Sisi's gost and/or the nearby item. The docu is a bit trashy as we had only three days for designing, coding, implementing, video shooting, editing, and ... having discussions with the makeup artist. Postdoc researcher at the Telekom Innovation Laboratories, Berlin. email: christina@christinadicke.com There's more info on the about me page.